The cycles of fiber jewlry....eco and vegan jewelry. Elegant and interesting pin ... fiber art ... nature jewelry...gift for her...wearable art... in sculpture shape...have organic design...soft and pleasant for wearing for everyday of little elegant occasion. 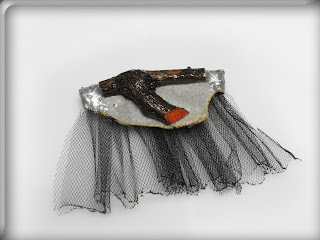 Pin is made of tulle, felt is burned on the edges, wood is covered with resin and colors, next to upper part of wood is silver pearl color. 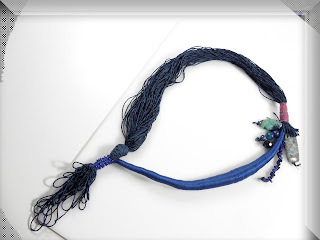 Long fiber beads necklace in organic design...soft and pleasant for wearing for everyday of little elegant occasion. Necklace has a dose of mystique. This necklace is artistic design. Has an organic shape inspired by branches have the contrast of cotton fabrics and glass and wood beads. All material is hight quality, necklace is well and strong shaped. You can wear this necklace on simple dress and you will look very special. Howdy. I discovered your blog utilizing msn. This is an exceptionally elegantly composed article.